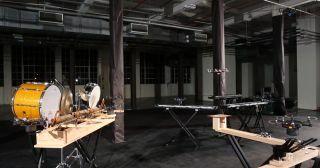 A still from a video by KMEL Robotics shows flying "hexrotors" playing music on specially modified musical instruments. The tiny drones play a variety of specially rigged musical instruments — including drums, guitar and keyboard — during their performance of the famous song, a Richard Strauss work called "Also Sprach Zarathustra." The robots then show their versatility, ringing out the holiday tune "Carol of the Bells" and playing the "Star Spangled Banner," among other songs. You can watch the entire four-minute concert here. "These robots represent a significant technological advancement because of their six propellors; most agile flying robots use only four," video producer and director Kurtis Sensenig told Space.com via email. "This may be the first time such a large swarm of hexrotors (named for the number of props) have flown in synchronization."